This Autumn and Winter, I’ve vowed to invest in key, quality, capsule pieces (how’s that for alliteration!). Every year I indulge in fast fashion and end up with fluffy jumpers and dresses that should’ve been left on the rack and they’re just not suitable to wear again the next year. They’re either too bobbly or the static makes the dress stick to my chunky thighs, thanks cheap polyester! As much as I do sometimes think I’m a bit of a brand snob, I’ve realised that I’m actually not. I don’t own any designer pieces and haven’t even invested in staple, transitional wardrobe items. I have however decided that this is the year this changes! Since I don’t shop designer I don’t really know where to start. I’ve also recently found out that a lot of actual designer branded handbags are made in the same factories as the real stuff. Not sure how I feel about that really. Plus my recent visit to Kyles made me realise just how important it is to support British designers and so that would definitely be my starting point. When Garment Quarter got in touch with me to have a look at their website I almost dismissed it because I honestly didn’t think I would like anything but it turns out I might actually be making my first ever “labelled” purchases from here. 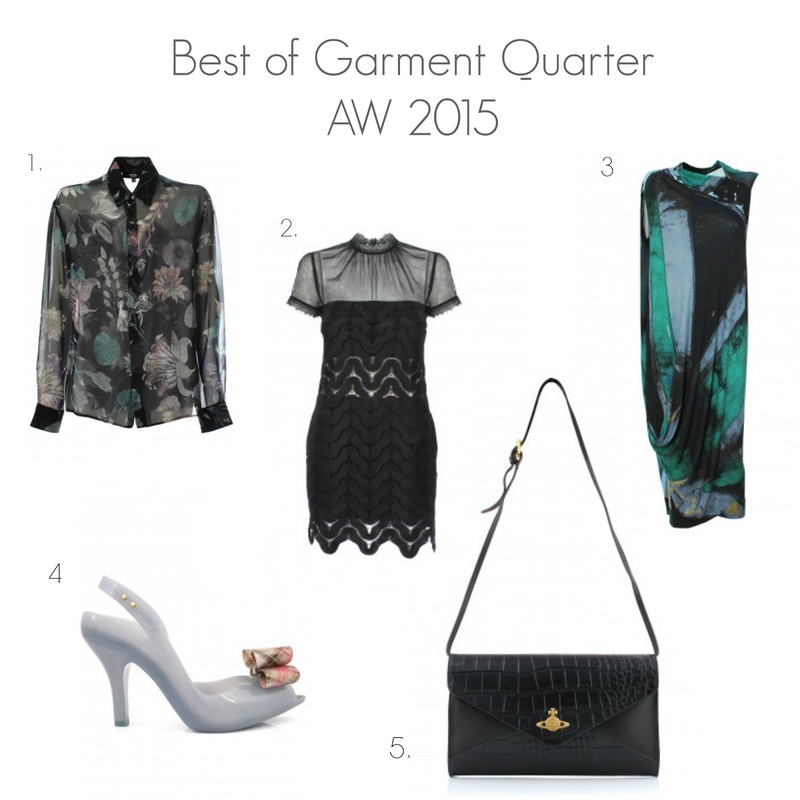 Here are my top 5 picks for AW15. I love this shirt so much, I can already imagine three different ways I would wear it and it’s definitely something that’s transitional both in terms of seasons and day/night. OK, how beautiful is this dress? It literally screams my name because first of all it is so me *hair flips* but also just because it’s so pretty! I love the victoriana neck and the fact that it has some sleevage. The midriff can be displayed or if I’m having a fat day I can wear a simple black slip underneath. Opaque tights could even turn it into a day dress. OH THE POSSIBILITIES! This is another dress that I instantly fell in love with. I love the colours and the abstract print, well everything about the dress is abstract really which is why I love it. I imagine it to fall beautifully when worn and plus it’s like an unwritten rule where asymmetry = super edgy, right? The shoe is called Lady Dragon!!!! If that alone hadn’t convinced me to press purchase then the pictures sure did. The shoes are so so beautiful. I wish I could walk in heels because I would wear these everywhere. I’d be known as the girl with the lady dragon shoes. Imagine! I don’t know what it is about mock croc bags but I’m all over them atm. I’ve searched high and low and I can’t quite find the right one that’s not too plasticy. This envelope clutch however looks amazing. I love how it’s offset with plain leather and that it can be used as a clutch or a cross body bag. 10 days til pay day you guys! You can bet your bottom dollar, or last pound at the bottom of my bag in my case, that Garment Quarter are going to be my first stop when the pay cheque comes through. Huge thanks to Garment Quarter for commissioning this post.